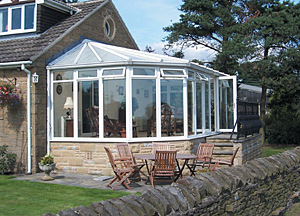 Add a little more luxury to your Lean-to Conservatory. As the name suggests, this is a lean-to roof but rather than the sides of the roof being finished using triangular PVCu infills, hips have been introduced. Largely this roof is chosen over the standard lean-to style because it is more pleasing to the eye and can create more volume internally and still avoid obstacles like overflow pipes. The average pitch on the main area of the roof is around 12 degrees. This is because the shorter side areas can't be more that 17 degrees more that an adjoining area across a hip. The roof design is very flexible as you can still have any width you require and the hips can be installed at various angles. The self build hipped lean-to kit is also available in full height glass. This can be a significant cost saver as opposed to building a dwarf wall and if you have a nice view of the garden, a pleasing feature as well. If you prefer the privacy a dwarf wall offers another cost saving excursive is to use insulated, reinforced PVCu panels. In order to do this a transom needs to be introduced to support the top of the infill panel and the glazing unit above it. As standard the panel heights are supplied in 600mm, 1200mm, 1600mm and full height of frame. But because all our DIY conservatories are bespoke, you can specify the height of panel you require. Keep in mind all the frames come fuuly glazed so you will not have to install the panels or glazing yourself.